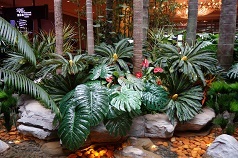 Challenge: Casino operator’s brief to minimize on the recurrent expenditure required for living plants by replacement and with a ‘tropical rainforest scheme’. 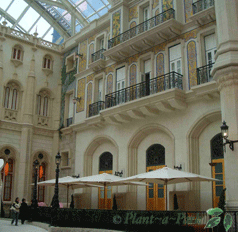 Challenge: Provide a park-like atmosphere in an interior, roofed, paved courtyard, approx. 4,000 sq. M, with ceiling of 30M. 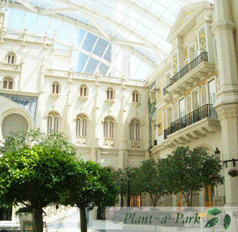 (Living plants could not be used due to lack of drainage and loading constraints). 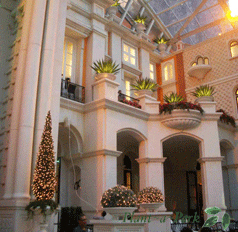 The ornate architectural detailing lining the façade of the courtyard dictated that a lightweight canopy be employed on man-made trees. Also, light-weight fiberglass planters were necessary to avoid excess loading. Solution: Provide 4 x 6M tall, and 3 x 5M tall Ficus Benjamina trees with spread of 4-5M, with see-through canopy to allow appreciation of the heavy architectural detailing. 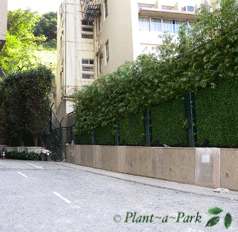 Trees were placed in lightweight lattice-detailed planter pots with separate inner bins for living underplants. Provide man-made Agave in client’s urns as lack of drainage prevented use of living plants. 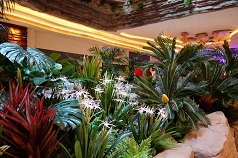 Provide hanging flowering plants to decorate ledges and balconies to provide “Mediterranean” feeling. 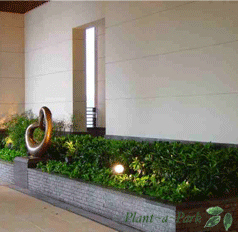 Provide 4M tall Cypress trees at either sides of Entrance. 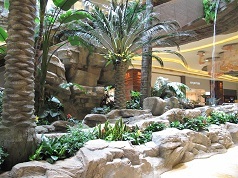 Challenge: Provide a garden setting, using man-made plants, incorporated with living plants, in area designated by property developer as “Sky Garden”, on 62nd Floor, for residents of tall residential apartment blocks, in a very windy situation with poor drainage., and poor natural light. Delivery constraints due to very small Service Lifts. Weather constraints as area is open to typhoon and wind damage. 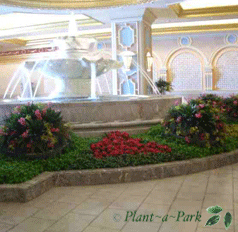 Plants to be round and soft as this area heavily used by children. 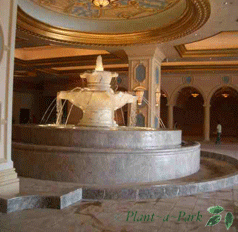 Challenge: Provide a bright, flowering, “face” of the entry to V.I.P. Motor Court, in a poorly lit, windy environment, subject to car exhaust fumes. Solution: A geometric solution (placing flowers in triangular “forms”) was devised to provide visual interest for drivers circling the VIP Motor Court entrance. Bright red/yellow/pink colour schemes enliven the space to compensate for very low light levels. Also, the bright colours withstand the exhaust from cars. Each triangular form can be easily removed for maintenance. 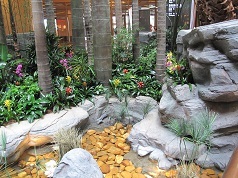 Challenge: Provide an oriental-style garden on false floor at the base of a 20-floor atrium. 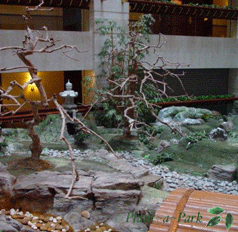 Garden to be sympathetic to large Chinese landscape scroll on rear of atrium. Major loading constraints. 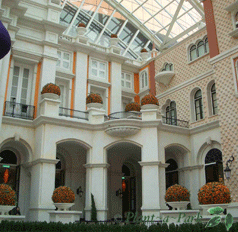 Surface of garden to be sufficiently durable for hotel’s Housekeeping and Engineering staff to carry out maintenance. 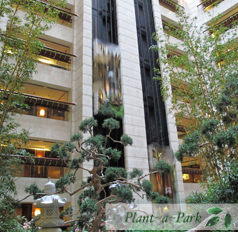 Overall look to be suitable for hotel guests staying at garden level, and also for those viewing the garden from the floors above. Surfaces were covered with grass carpet. Pebbles were applied to the stream bed. 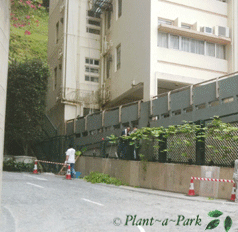 Challenge: Request from the client was to disguise the ugly fence between two very large apartment buildings in Mid-Levels, Hong Kong. 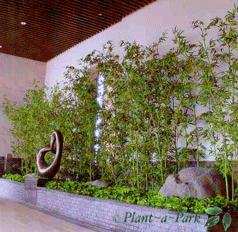 Solution: We designed the lower portion with boxwood matting attached to wire frames, and the upper portion with bamboo.